Feature sleek flexible lightweight design with soft feel temples for added comfort. Scratch-resistant dual polycarbonate lens offers 99% UV protection. Frame Color: Black. The dielectric lightweight polycarbonate frame features a single flexible lens that blocks 99.9% of ultraviolet rays and provides an excellent orbital seal. 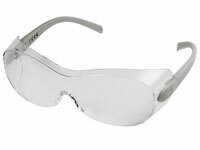 A unique Flarefit temple design distinguishes this Plus series protective eyewear offering. Additional features include non-slip wrap-around TPR temple sleeves for comfort and grip plus an adjustable soft TPR nose pad. All lens treated with our exclusive Duramass scratch resistant coating. Includes cord.